Regional Resources presently services all of the deregulated energy markets in the United States where one can operate as an energy broker. These territories include New Jersey, Pennsylvania, Illinois, Michigan, Texas, New York, California, Massachusetts, Ohio, District of Columbia, Arizona and Nevada. 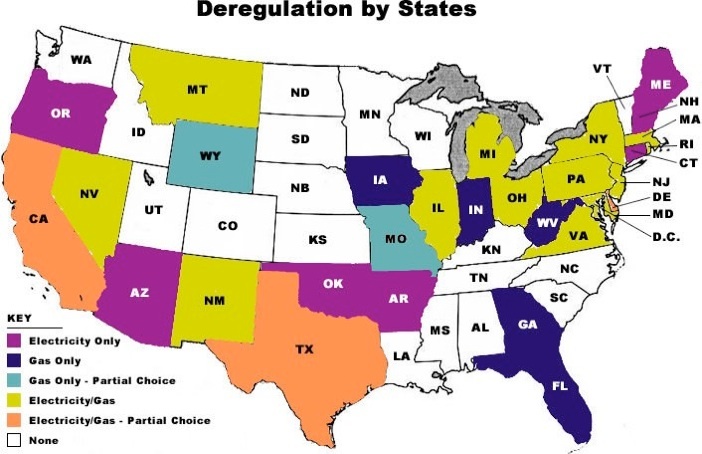 The map below shows every state presently subject to some type of energy deregulation, and the specific type of deregulation. Look for further RRMI expansion in all deregulated territories to follow in order of developing interest and need in the coming months.